When it comes to cards, I have a love of simplicity, and I have a bit of a thing for heat embossing. This is possibly the simplest card you could make. I took a white card base and put a strip of Perfect Plum along the width. On another piece of white card I have stamped an image from the Summer Silhouettes stamp set with Versamark “ink” and then heat embossed it in white. 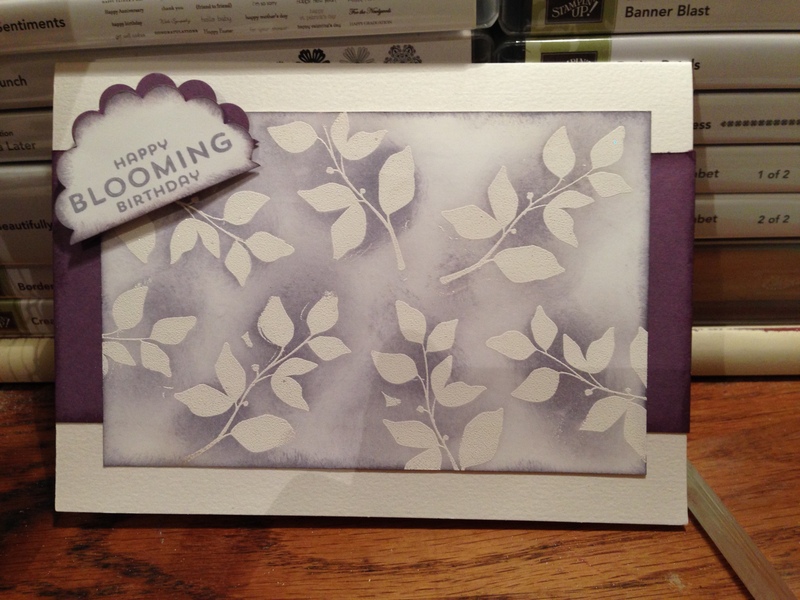 With a sponge, I then rubbed Wisteria Wonder ink over the card, starting with the leaves and working outwards. Then returning to rub more ink over parts where I wanted a darker colour. You could very easily use more than one colour if you wish. The sentiment comes from a retired stamp set which was available during the last Sale-a-Bration (watch out for news of the next one), on half of a circle cut using the largest of the scalloped circle punches backed by another half cut from Perfecct Plum card. Sometimes simple can be more effective than complicated don’t you think?